Delta leaders explained to Wall Street how 2018 performance shows Delta is on track to continue leading the industry. Here’s a recap of what Delta leaders are saying from the stage in New York at Delta’s 2018 Investor Day. Speakers are highlighting a successful 2018, setting 2019 targets and explaining to Wall Street why Delta’s durable and sustainable business model creates resiliency for employees, customers and owners. 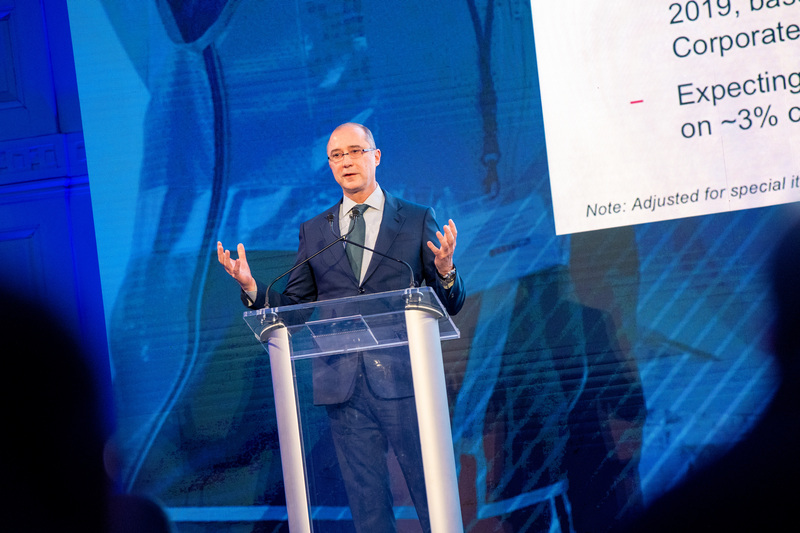 Investor Day 2018 began with a recap of the year’s successes, including how the Delta team enabled an industry-leading operation and offset 90 percent of a fuel cost headwind through revenue growth. Delivering superior financial results – 2019 is expected to deliver profits over $5 billion for a fifth consecutive year, with a return to margin expansion driving double-digit earnings-per-share growth and 15 percent after-tax returns on invested capital. A powerful consumer brand rooted in a unique culture, with building momentum and a sustainable revenue premium. An increasingly diverse revenue stream with less than half of revenues from Main Cabin, and strong growth prospects from premium products. Non-fuel cost trajectory below inflation as efficiency initiatives gain momentum, and fleet transformation continues. Opportunity to drive top-line growth and margin expansion from fleet transformation, technology innovation, joint ventures, loyalty program and maintenance, repair and overhaul business expansion. 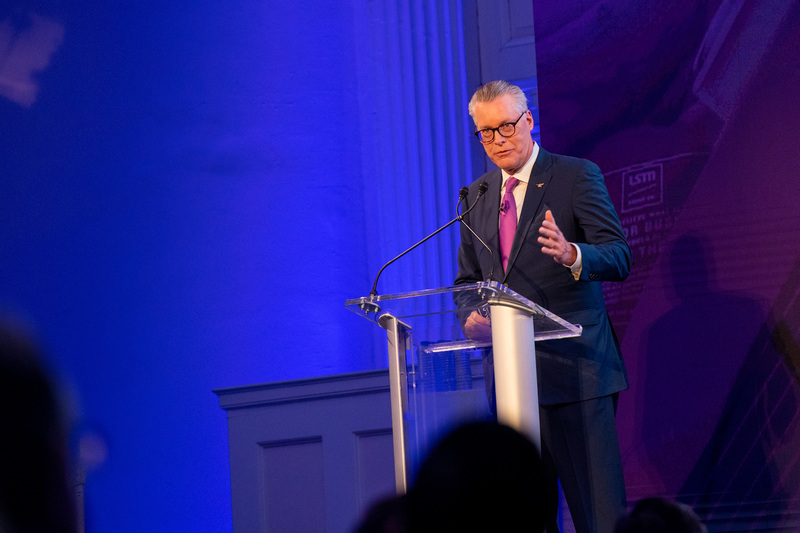 He expounded on Delta’s projection of 4-6 percent top-line revenue growth in 2019, saying demand remands strong for all of Delta’s products and services, and the company is just getting started to really provide what customers want in the marketplace. Providing the leading domestic network. Fleet transformation to highly-efficient and customer experience-rich aircraft with larger gauge and better efficiency. Excellent global partners that provide seamless worldwide access for customers. Premium onboard products like Delta One and Delta Premium Select. West told attendees that more customers arrive on-time on Delta than on any other airline, through industry-best completion factor and on-time arrivals as measured by preliminary DOT data. He underscored that a high degree of operational reliability is a bedrock for continuous improvement across all aspects of Delta’s business, and is a catalyst for applied innovation as well as boosting Delta’s competitive advantage at its subsidiary businesses, like Delta Material Services and Delta Flight Products. 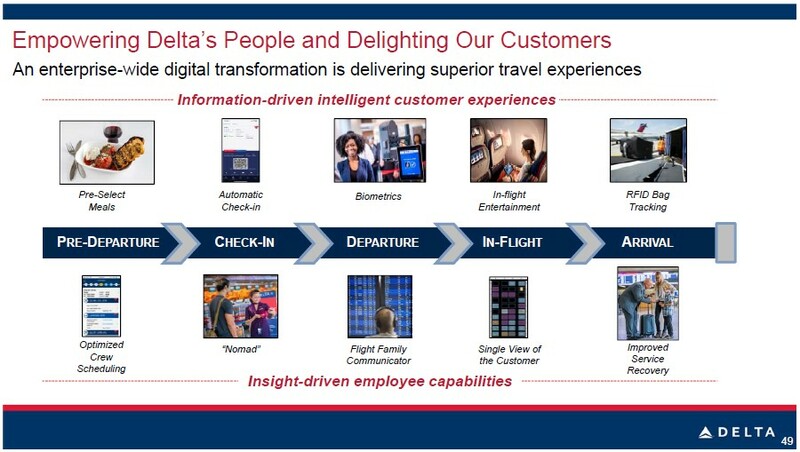 That’s how Mapes began his remarks, noting that Delta excels at gathering and interpreting data from nearly 200 million customers a year to evaluate their likes, dislikes and much more. “We have a bias toward action that feeds into this idea of listen, respond, listen,” he said. 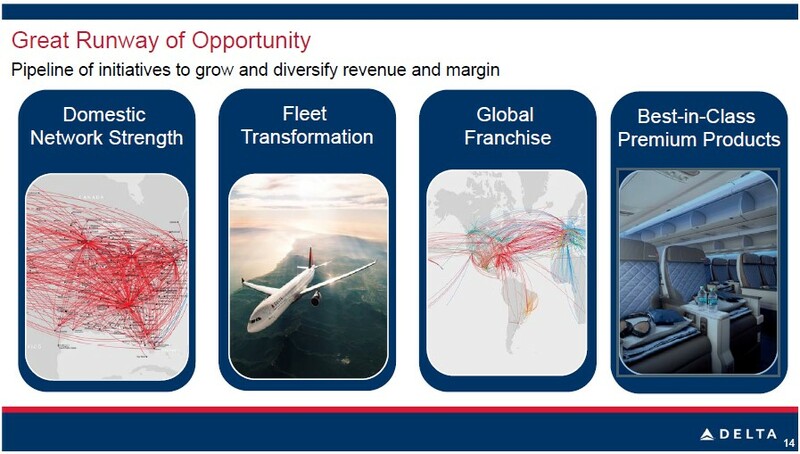 Phillips detailed Delta’s trajectory to improve choice and customizability for Delta’s customers through a growing array of products and service. 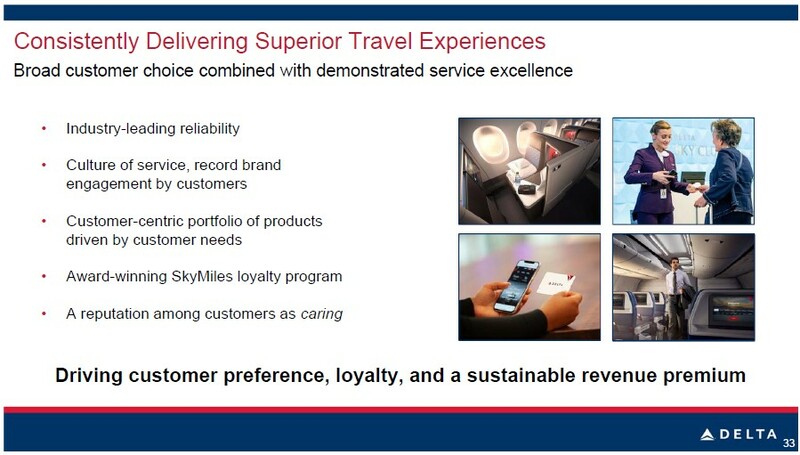 He added that premium products are top of mind for Delta customers and that their behavior has validated Delta’s investments in Delta Comfort+, Delta Premium Select, the Delta One suite and, most recently, the ability to purchase upgrades with Delta SkyMiles. 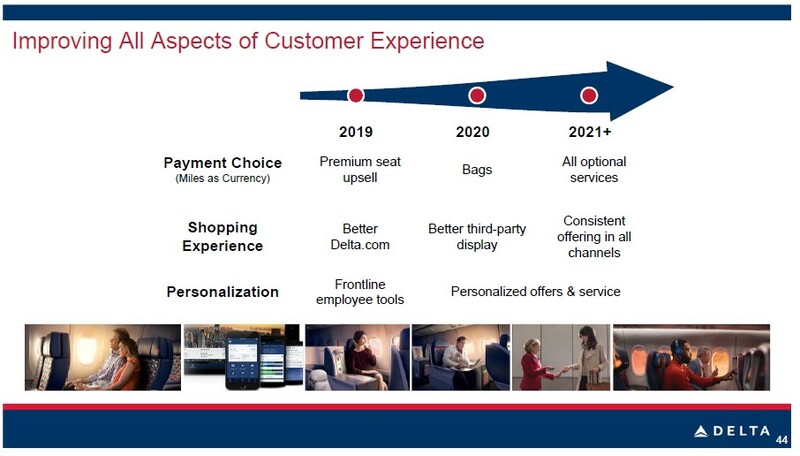 He also said the ability to pay for checked bags with miles is expected to be available in 2020 as well as ongoing enhancements to the delta.com shopping experience and overall personalization. Smith detailed why Delta’s unique culture provides a competitive advantage and how making a great place to work for employees is what sets Delta apart from competitors. 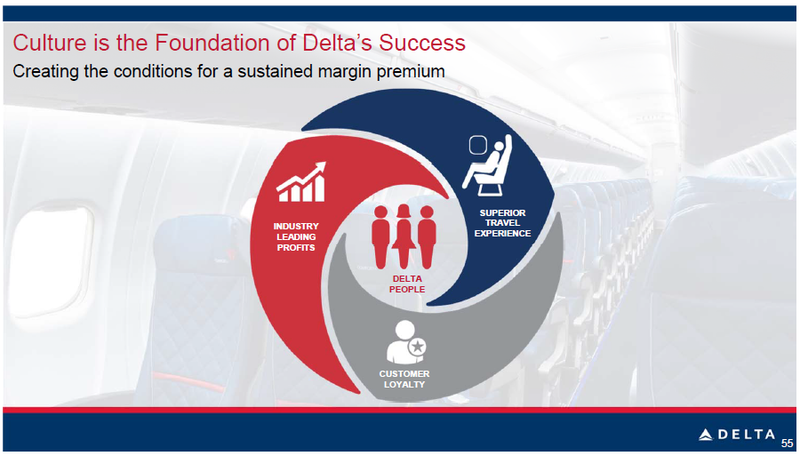 Delta’s culture is the foundation of Delta’s success and creates the conditions for a sustained margin premium, a metric of growing importance to investors, and operates in a cycle that continually feeds on itself and creates momentum, she explained. “I feel very good about where we are today, with less unknowns and more in the hands of execution which is where our team excels,” Jacobson said, summing up for investors Delta’s strong position heading into 2019. The fact that 35 percent of Delta’s mainline fleet will be replaced by 2023 is a huge opportunity for boosting efficiency through reduced fuel burn and larger gauge, he said. At the same time, these new aircraft will enhance the customer experience and offer more premium seats. Bastian and a group of frontline employees capped off Delta’s 2018 Investor Day with a $25,000 check presentation to Gen. Pete Osman (ret.) CEO and President Marine Toys for Tots Foundation. This entry was posted in Delta Air Lines and tagged Delta Air Lines on December 14, 2018 by Bruce Drum.